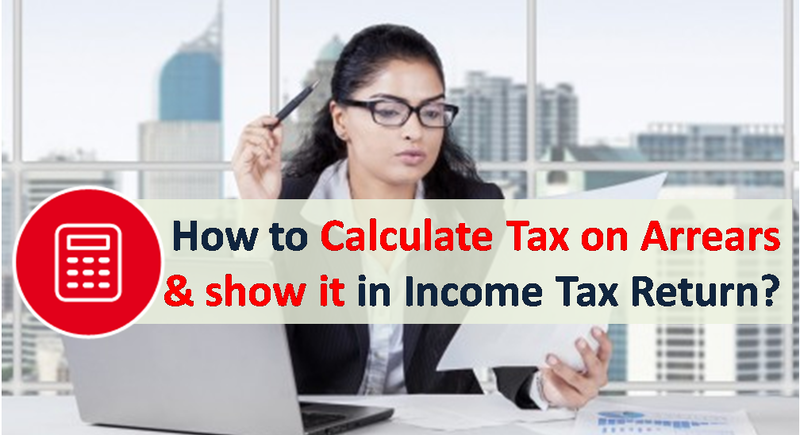 How to Calculate Tax on Arrears u/s 89(1) & show it in ITR? This year might have been happy one for you if you received long pending salary dues as arrears. But we know receiving arrears makes everyone happy but pain of paying higher taxes makes them worried? We explain how to calculate tax on arrears and claim tax benefit u/s 89(1) in income tax return with example. We take a simple example. Amit is a government employee and he has received his long awaited salary dues as arrears. Here are the numbers. We use this example to illustrate tax calculation on arrears. For simplicity we would assume that Amit has not invested for any tax exemption, so his income stated above is “Net Taxable Income”. Calculate new tax payable for each financial year where the component of arrears is present i.e. adding arrears to the old income in respective financial years. Add the excess tax payable across the financial years due to arrears. In our case it comes out to be Rs 1,03,000. This means that had the salary payout been on time you would have paid this amount as tax. Subtract the excess tax payable due to arrears in Step 3 from the additional tax payable in Step 5. Tax Difference: Rs 1,44,200 – Rs 1,03,000 = Rs 41,200. If you consider arrears payment as income for only present financial year, you would be paying Rs 41,200 extra as taxes, without any fault of yours. Government thankfully understands the situation and has provided relief for tax payers under Section 89(1). Also Read: Submit Income Tax Proof to Employer – How, When and Why? To claim the above tax benefit u/s 89(1), you need to fill up Form 10E. From FY 2014-15 (assessment year 2015-16), the income tax department has made it mandatory to file Form 10E if you want to claim relief under section 89(1). The form can be filled online on the Income Tax Website. The question is what would have happened if there was no excess or lower tax as in Step 6? There would be no special treatment. You just calculate your tax after adding arrears and pay our taxes. Section 89(1) would not be applicable! Form 10E: How to fill? Login to Income Tax efiling website. On the next screen, select Form 10E and the Assessment Year from the drop down. The Form 10E would be displayed with instructions and annexure. Fill the relevant details and submit. You can download the income tax calculator for past financial years here. Use them to calculate your taxes for the respective years. I received my arrear salary for the last four years in the month of December 2018 after an administrative decision taken in the month of October 2018. However, my employer did not deduct any TDS on this amount. Now I have estimated my total tax liability for this financial year and deposited the entire tax as advance tax in the month of February 2019. My question is whether IT department will impose any penalty interest u/s 234C of IT act on me. I do not think IT department would impose any penalty. If it does let them know the situation.